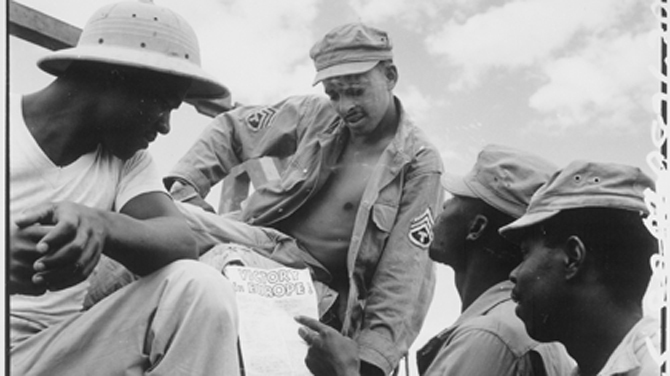 Allied troops in Burma stop work briefly to read President Truman's Proclamation of Victory in Europe. LAIZA, Kachin State—They're in their 80s and 90s, and it all happened a very long time ago and far away, but American World War II veterans are still repaying “debts” to their comrades-in-arms in northern Burma—because without them they might never have returned home. Instead of retelling war stories as old soldiers are prone to do, these survivors of some of the war's harshest campaigns have set up education, health and other programs in this remote region to help the Kachin, an ethnic group that fought alongside them against the Japanese. The brotherly bonds, both sides say, have not been severed despite the passing of 70 years, the isolationist policies of Burma and a long-running conflict between the autonomy-seeking Kachin and the military-backed government. “We were all for one and one for all,” remembers American Sam Spector of his days as an 18-year-old combat radio operator. Among the ravishing mountains and valleys, the Kachin remember the Americans in a legendary light, as part of their folklore. It was an improbable but remarkable partnership. The Americans came from the Office of Strategic Services, the predecessor of the CIA. Young and inexperienced, most had only seen jungles in the movies. Some of the Kachin, then a largely illiterate people, had never seen a wheel. The Kachin tutored the newcomers in jungle survival and in turn were taught modern warfare. They formed a guerrilla force, the Kachin Rangers, which numbered 10,800 at its peak and killed 5,400 Japanese while losing only 202 of their own — one of the highest kill-loss ratios in U.S. military history. They demolished Japanese bridges and trains, provided intelligence and rescued 425 downed airmen. Peter Lutken, a battalion commander who fought with the Kachin behind Japanese lines, learned their language and culture around campfires. “They loved him and he probably would not be alive today without their friendship—neither would most other American and British soldiers in that part of the war,” said his son, Peter Lutken III. The elder Lutken, a retired businessman who lives in Dallas, was among a group of veterans who made a return trip to Burma in 1995, the 50th anniversary of the end of World War II. He spoke of “a debt of honor” owed by his unit, Detachment 101 of the Office of Strategic Services. An initial effort right after the war failed, and subsequent ones were stalled by Burma's government, which was trying to suppress the Kachin insurgency and also growing more hostile to the United States. In 1996 the veterans began Project Old Soldier, training impoverished villagers to plant corn, buckwheat and other crops instead of opium, sending nurses to visit ailing Kachin veterans and aiding orphans. Eight years later they started 101 Schools, which teaches mathematics and English to classes of up to 500 students in open-sided sheds, barns and church outbuildings in the largely Christian community. The veterans have not been to Kachin state since the 1990s but continue to funnel in funds from the United States. Among the few foreign aid groups allowed to operate in northern Burma, the two organizations have funded the translation and printing of health care manuals and hope to assist some of the more than 75,000 refugees from fighting which erupted again last year. The Kachin first took up arms against the regime in 1961 and Kachin state remains a patchwork of areas, some controlled by the government and others by the rebel Kachin Independence Organization. Dan Tarter, a retired U.S. Army colonel who administers 101 Schools, says that after some initial wariness the government has not interfered in the veterans' efforts, even inviting them to expand the projects. He ascribes this to the low profile and nonpolitical, nonreligious nature of the aid. “We operate like a program named for 0SS 101 should operate—quietly,” he says. The Kachin insurgents welcome the assistance. “American veterans and their children are grateful to us. What a great History we lost. Aung San was fighting against Allie forces. Only after Mandalay fell to allied forces, Aung San Switched side. Aung San Su Kyi is doing the same just like her grand old Daddy. Switching side when there is no hope. Aung San forces had a reputation of looting and robbing villages and intimidating on their own villagers just like Tatmadaw today.